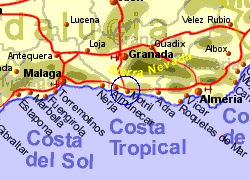 Motril is a large town just in from the coast of Granada Province, known as the Costa Tropical due to the climate there. The sub tropical climate facilitates the growing of oranges, lemons, custard apples, avocados, mangoes, bananas and sugar cane used to be grown and processed in the area in a big way. The town itself is a busy place with a hypermarket on the outskirts and number of supermarkets, bars, restaurants and nightclubs in and around the town centre. On the coast, the marina provides a selection of water sports and boat trips while there are a choice of excellent beaches. 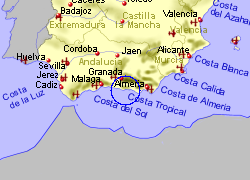 The Alpujarras, the city of Granada and the Sierra Nevada are within easy driving distance. 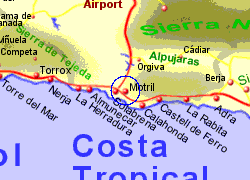 Map of the Motril area.